Before discovering the programs we offer, this page offers you information about our curriculum structure, hours of study available and the levels we offer. Quest programs have been carefully designed with your needs as our first priority. All our programs are clearly defined and offer a comprehensive approach to language learning based on proven communicative techniques. 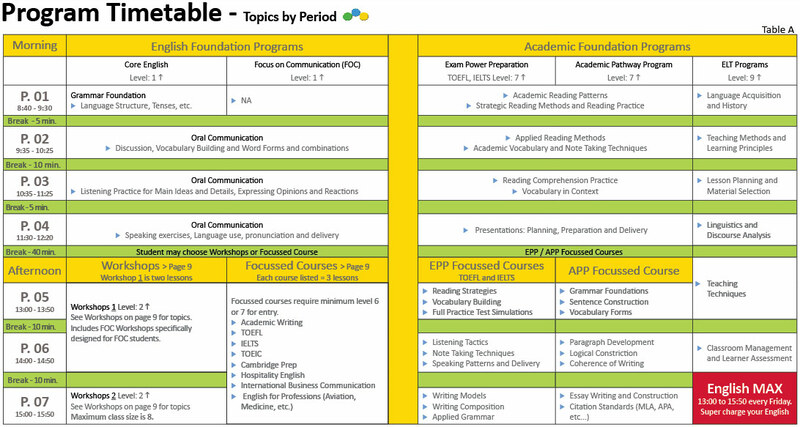 The tables below show the structure of our programs (Table A) and the course options available for the study periods (Table B). 24 lessons per week - Focus on Communication Program only. Quest offers eleven levels of language proficiency. 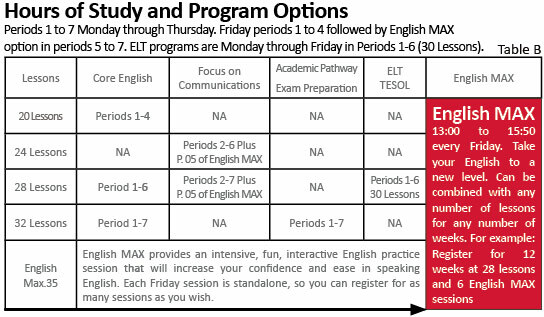 Student progress through the levels is based on weekly review testing and monthly progress evaluations, described below. Each level takes approximately 4 to 5 weeks to complete. Start - Placement test: on your first day you will be tested for all language skills (speaking, listening, writing and grammar) and placed in the appropriate level for grammar and oral instruction. During - Weekly Review Testing: Weekly written review tests and monthly one-on-one oral tests provide students with regular feedback and help determine progress. Your instructor keeps track of your scores and will provide you with a monthly Student Progress Evaluation Report which is accessible via the web. Your test results combined with your Evaluation report determine your readiness to move to the next level - approximately every 4 to 5 weeks. End - Program Completion: To successfuly complete a level students must maintain an average of 80% on their test scores and attendance. Upon successful completion, you will recive a certificate detailing your course of studies and any distinctions receved.